The MP 501SPF and the MP 601SPF are two new MFPs with higher volume in Ricoh's black and white devices. Both devices offer standard printing, copying, scanning and optional faxing. The MP 501SPF ($3,499) has a speed of 52ppm and a working cycle of 250,000 pages. The MP 601SPF (4,499 US dollar), on the other hand, runs at 62 pages per minute and has a working cycle of 275,000 pages. Both machines have a first copy time of under six seconds. There is a 1.46 GHz processor, 2GB of memory and a 320 GB hard drive. There is also a 10.1 "Touchscreen smart operation panel for accessing workflows and information. Users can access information that is equipped with the same flick swipe feature that is common on the smartphone. You can also customize the user interface with one-touch workflows for common tasks such as printing, scanning, or access to the document server. PCL, PostScript and direct PDF print languages are standard. Users can add the XPS print format as an option. USB and Ethernet connections are supported, while wireless, Bluetooth and parallel are optional. 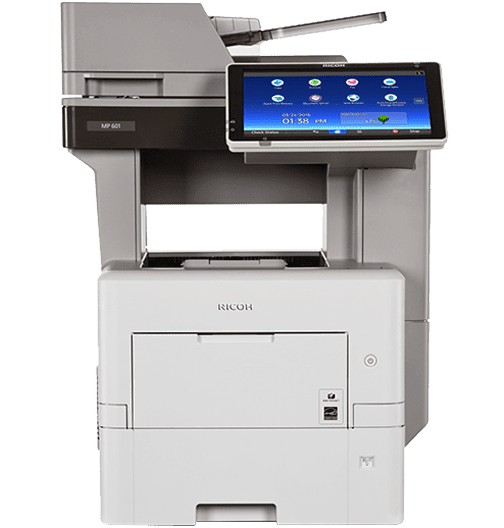 Mobile printing is supported by Ricoh's smart Device Connector app. Further details can be found in our functional area below. The MP 501SPF and the MP 601SPF are high-performance devices for offices with heavy pressure volumes. They are also suitable for offices that do not require printing or copying colors. Produce and share information quickly. Print black and white images with a resolution of 1200 x 1200 dpi with up to 62 pages per minute (ppm). Scan full-color or black-and-white originals and distribute them using the automatic reversed document feeder (ARDF) and Scan-to-scan features. Optionally, add paperless faxing to simplify the distribution of contracts and other forms. You can even add Ricoh Streamline NX, Device Manager NX, and other software to create automated workflows. Do not hesitate-select the MP 601SPF to minimize work interruptions. The high-yield components are designed for an almost maintenance-free operation of up to 500,000 printouts. Add up to four adjustable paper sources to increase paper capacity for less reloads on 2,600 sheets. Use the MP 601SPF as the primary information hub in shared-use environments. Whether in the corner or in a closet, this powerful MFP can improve workflows and reliably and economically support PC, Mac ®, and host printing applications. Switch between tasks and jobs using the same familiar touchscreen gestures that you use on your smartphone or tablet. With WorkStyle innovation technology, you can customize the digital user interface with the information you need to get things done faster. Simply navigate through the intuitive, grid-like touchscreen to quickly create or share information. Create personalized shortcuts to reduce manual tasks. Use the one-touch control for basic copy, print, scan, and fax tasks, as well as special features such as copy ID card. Download Workflow apps and information-rich widgets from the Ricoh application site. Then, place it on the home screen to easily access the information you need most. Keep information ready wherever you work. Use your smartphone or tablet to remotely print the MP 601SPF when you download the Ricoh Smart Device Connector app and the Ricoh app for Google Cloud Print. Find your favorite cloud applications. Or you can get it online through the integrated web browser of the MFP. Don't lose sight of security. Use your password, billing code, or the optional NFC card reader to log in to key functions so that you can control and track who is using the device. Connect it to accounting software such as Ricoh Device Manager NX Accounting and reposting problem to individuals or workgroups. Limit excessive printing by issuing print quotas as needed. Perform administrative tasks remotely with the Web Image Monitor. Plan big savings with the MP 601SPF. It is EPEAT ® Silver Certified and Energy STAR ™ certified and has a low typical power consumption (TEC). You can also set duplex printing to reduce paper consumption by half. With the MP 601SPF, you can create a larger selection of documents in formats up to 8.5 "x 14" to meet the specific needs of your target groups. Use the 100-sheet bypass to print envelopes and thicker materials up to £120. Index. Create a server-like information hub by saving documents to disk and then accessing them to easily print on demand.